Paid security suites offer a variety of services, but their basic AV capabilities are being equaled by free apps. If you’re worried about malware infecting your PC, you may subscribe to a security suite. But AV-Test’s recent evaluation of the top antivirus software reveals a free service, Avast, at the top of the heap—and Windows’ own Windows Defender just a shade behind. The implication? First, that Microsoft’s own built-in protections are no longer the joke they once were, and second, that consumers may be overspending for protection that other services provide for free. The best modern security suites offer a number of benefits that go beyond strictly antimalware, of course: securing your PC against ransomware, providing a built-in firewall to replace Windows’ own, protecting payment information and passwords, and using AI-like behavior to block zero-day attacks as they occur. Some even tack on VPN services, too. What this means to you: While some of these extra protections offer great value—PCWorld recommends the use of a password manager, and VPNs are useful for preserving privacy—they can also be purchased piecemeal. And while it’s true that there’s a case to be made for the comprehensive protection offered by a security suite, the November-December test run by AV-test.org is basically an argument that free services provide just as good, or even better, protection and usability as a suite you’ll pay for. AV-test is an independent research house from Germany, and the organization continuously tests the major antivirus suites, publishing reports every few months. Because of the fluid nature of malware and how AV apps responds to it, the best solutions often move up and down the rankings. Each suite is ranked on three criteria: protection, performance, and usability, earning up to 6 points in each category. 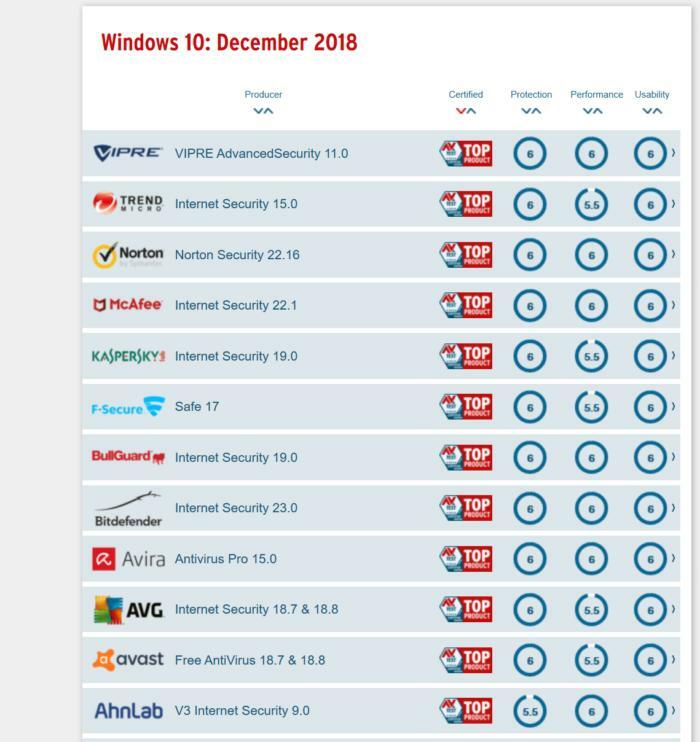 Twelve products were ranked as an AV-Test “Top Product,” where no category scored less than a 5.5: Vipre Advanced Security 11.0, Trend Micro’s Internet Security 15.0, Norton Security 22.16, McAfee Internet Security 22.1, Kaspersky Internet Security 19.0, F-Secure Safe 17, BullGuard’s Internet Security 19.0, Bitdefender Internet Security 23.0, Avira Antivirus Pro, AVG Internet Security 18.7/18.8, Avast Free Antivirus 18.7/18.8, and AhnLab V3 Internet Security 9.0. Traditionally, Microsoft’s Windows Defender was considered the “baseline” product, one which the paid suites would have to surpass to prove themselves worthy. And Windows Defender still retains a “Certified” ranking, and not the “Top Product” award that the others have. The top 12 antivirus suites, as ranked by AV-test.org for December 2018. Note that these are ordered alphabetically. But if you rank each suite by its “protection” ranking, Windows Defender comes in sixth out of the 20 suites AV-Test evaluated. And according to the lab, it blocked every zero-day malware attack it fielded (out of 259) as well as 99.9 percent of the 19,697 other pieces of “widespread and prevalent” malware it was tested against. (The industry average was 99.6 percent of all zero-day malware blocked, and 100 percent of all “prevalent” malware.) 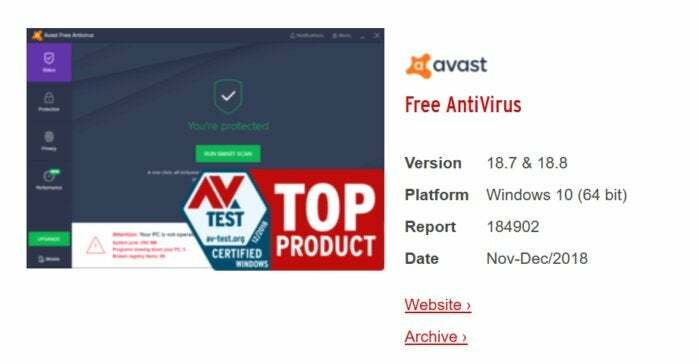 Avast’s free antivirus suite blocked everything, both zero-day and prevalent malware. Windows Defender did have its flaws. AV-Test knocked it for slowing down the installation of standard software apps, though that’s obviously an infrequent activity. A more serious shortcoming was identifying legitimate software as malware—though this happened 7 times in over 1.5 million samples, when the industry average was 5. Windows 10’s built-in virus and threat protection can be accessed from the Windows Defender Security Center. Avast, for its part, was marked down for opening popular websites more slowly than the industry average, most likely because it was scanning them for potential threats. But it only misidentified legitimate software as malware once. AV-test’s results still identified suites as having perfect or near-perfect results; McAfee’s Internet Security caught every piece of malware, performed faster on the web and apps than the industry average, and never misidentified a legitimate app. Other paid suites performed as well. 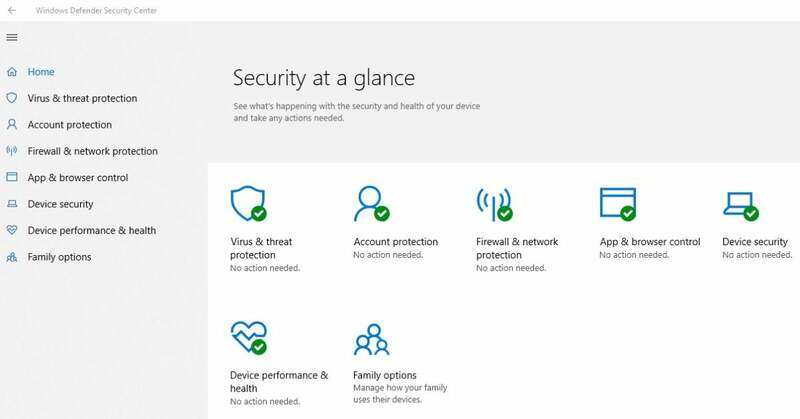 Still, if you’re a cheapskate or just lazy, or merely forgot to download an antivirus program when you built a new PC, it appears that Microsoft has you covered. And if you want to step up to a suite, Avast offers antivirus, Wi-Fi security, and a password vault—all for free. While there are still compelling reasons to invest in a paid security suite, AV-Test’s results present a decent counterargument.